Live, From My Living Room, It’s…Me! The other day, I tried using YouTube Live for the first time. I may be late to the game — real late — but I’ve been fascinated by the idea of live-streaming for a few years now. My initial interest was in doing a live simulcast of an alternate audio score to something airing on TCM. Audio-only proved near-impossible. It’s weird that you can livestream video from anywhere, easily, on a number of platforms, and yet try looking into do the same for just audio. I can broadcast video from my phone anywhere I can get a signal but try and set up a radio station…? Lotsa luck. Synch was the biggest bugaboo I hit, right behind being able to stay up late for “Silent Sunday Night” to play for a film from midnight to 2 am. A friend in broadcasting reminded me that people around the U.S. on different cable systems would be behind or ahead of whatever I was streaming by a number of seconds, so this alternate simulcast score idea was out. 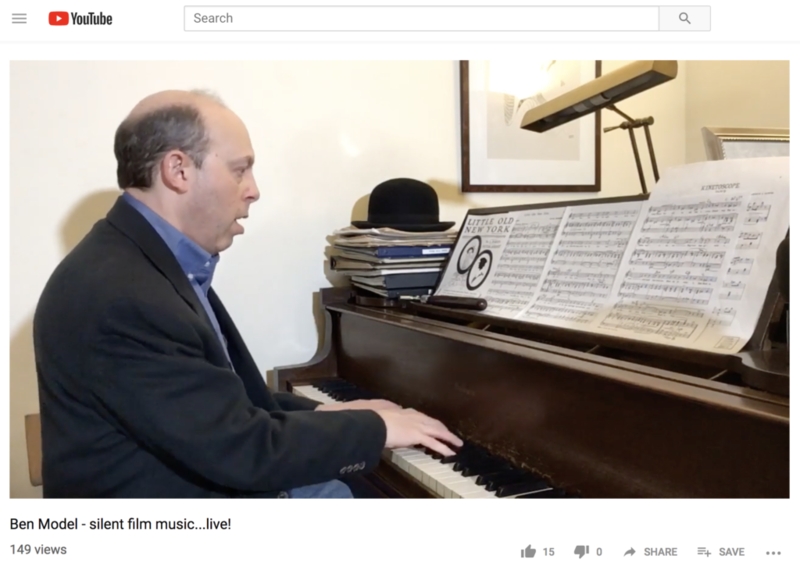 I know from my research over the last number of years into what folks in the music industry are doing to survive that Facebook Live and YouTube Live can be a great way to connect with fans. I’m willing to try anything, and to try anything without being concerned about the number of views or hits or comments or likes. It did occur to me, though, that 2,700 or so people have subscribed to my YouTube channel, and that there may not be much of an overlap between these folks (maybe you’re one of them?) and my email list, Twitter, FB, Insta etc. And so, inspired by something I discovered about a very early Ernie Kovacs program — a 15-minute show that aired mid-afternoon in 1951 called “It’s Time For Ernie” — I did a quick 5-minute broadcast. This particular Kovacs’ show initially aired just three times, a couple months before it went on the air on a daily basis. This was while he was doing his daily 2-hour morning wakeup show on WPTZ called “Three To Get Ready”. The kinescope for one of these trials, which strangely matches the one surviving kinnie of the regular run (where he demonstrates the TV knobs), is clearly being done as a trial and with extremely low stakes. Early in 1951 in the Philly are there weren’t loads of people who owned TVs and who would be watching them at 3 o’clock, and the show’s informality is even more than it usually is in a Kovacs show. Kovacs is clearly unaware they’ve started when the show begins, and even tries to restart the show. The one thing he’s clearly got planned is the bit with the TV knobs around his neck, and it’s clear the cameraman didn’t quite get it as it’s shot slightly wrong…something Ernie made sure got done right for the broadcast of the show’s actual run in May or June of 1951. It was that “it’s okay, no one knew we were doing this and probably no one’s even watching” feel of the show that encouraged me to give this a shot. On January 9 around 4pm, without previously announcing I was going to do this, I went live on YouTube, for about 5 minutes. Having done a sporadically-posted podcast for several years as well as having made Kickstarter videos, I was somewhat prepared. I even made up index cards marked with bullet points with a Sharpie. And I just went for it. It was a tad nerve-wracking, and I suppose I could have pre-recorded this and then posted it. But there’s something a bit more honest about not being able to take it again and just going for it. If I can make myself schedule it and stick to it, I’ll do this on a regular basis. In case you missed it, you can watch my test drive here. You can watch Kovacs’ tryout of It’s Time For Ernie from March 7, 1951 on the Shout Factory TV website here. To see the real, later broadcast of the show, pick up the Ernie Kovacs Centennial Collection.